I shouldn’t probably say, “Happy Monday” knowing that lots of us hate Mondays, but also knowing that having a life is a blessing, – We’ll put our hate aside and celebrate the fact that we’re alive. How was your weekend? Did anything fun? Mine was ok. I bonded with a couple of friends, but the weather was terrible. It rained cats and dogs throughout Saturday and Sunday. Mood killer! Anyways, I’m just passing through with a little motivational quote to encourage someone. 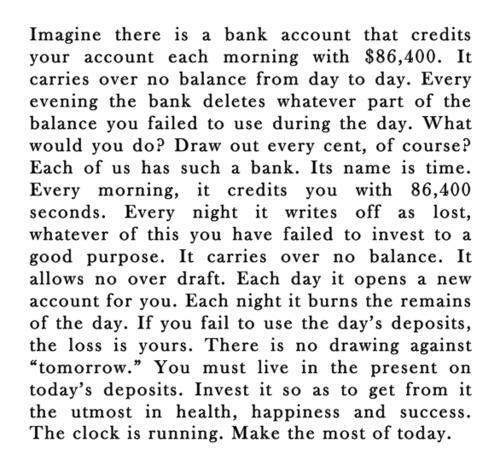 As the saying goes, “time is money” so make the best out of it. Don’t waste it on people and things that don’t deserve it. If it means being selfish, then so be it. It is you that matters, Beauties.